Join us to celebrate the fall waterfowl migration! 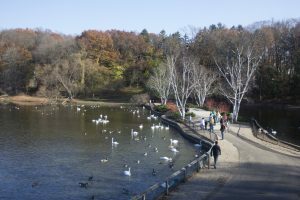 The Kellogg Bird Sanctuary’s Wintergreen Lake provides a safe haven for birds to fuel up as they travel from breeding grounds in the far North to winter grounds in the Southern US and beyond. Practice waterfowl ID along the lakeshore, participate in games and activities along the trail, and warm up with cider at the end of your walk.